Remembrance Day, and the wearing of poppies, seems to be something that divides opinions and causes a certain amount of friction, especially in Britain. On one side, there are those who say that simply wearing a red poppy is a glorification of militarism, whilst on the other are those who argue that it is all about respect; about honouring the dead. Are we remembering the First World War, one hundred years ago, or are we celebrating it? There would seem to be quite a few people, judging from conversations that I have heard and threads that I have seen, who are happy to confuse the two and seem unwilling to listen to what is really being said. Unfortunately, as soon as a debate becomes in any way emotional, then there is a tendency both for people’s opinions to become polarised, and for their perceptions of the opinions of others to also become polarised. And then anything that your ‘opponent’ says is jumped upon as furiously as if they had just advocated the torture and murder of all children and little furry animals. But they haven’t, so calm down. 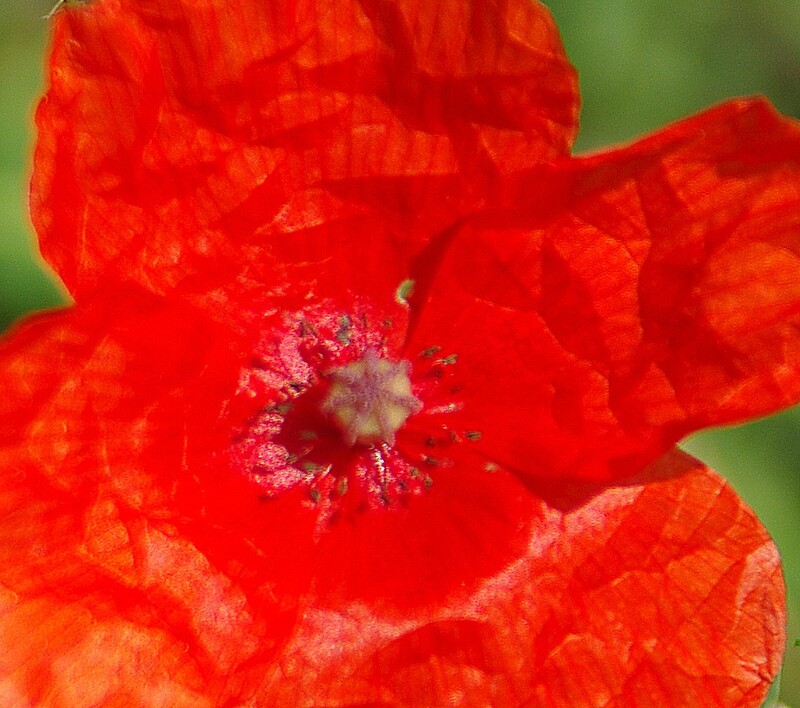 It may come as a surprise to some people, but the poppy was not chosen because the red colour of its petals symbolised bloodshed, but because of its ability to bloom where the ground has been smashed and churned up, such as at the Somme, where it was noticed by a Canadian soldier, Col. John McCrae, a physician, who wrote a poem about it, and through this it was adopted later by the Royal British Legion as a symbol for their poppy appeal. It is intended to symbolise how someone whose life has been in dreadful turmoil may come later to peace and normality. The white poppy was first used in 1933, to remember those who had died, but also as a determination to work for peace. It was mildly controversial at the time, and some women lost their jobs for wearing it, but in more recent times Margaret Thatcher expressed her distaste for it and there are many now who follow her lead. The Royal British Legion point out that they have no objection to the white poppy or, as some people like to do, it being worn alongside the red poppy. To return to the controversy, then. Why does it only commemorate the military? What about the civilians who died? What about the conscientious objectors who died for their beliefs? When it was first used by the Royal British Legion, it was to raise funds for disabled servicemen and the families of those who had been killed, so this wasn’t an issue then. When the white poppy was introduced, in many people’s minds it came to represent those others. Does it glorify war? In some people’s minds, no doubt, it does, but this is not its purpose. Even the military will say that part of the purpose of Remembrance Day is to help to ensure that a war like WW1 never happens again. It is important to remember the horrors to avoid sleepwalking into them again. There are also many people who feel it terribly important that it should be worn the ‘right way’, but there is no agreement over what this ‘right way’ is. Some say it should be worn on the left side, some that men should wear it on the left and women the right. Many argue over when it should be first worn – from October 31st? The eleven days leading up to Remembrance Day? After Guy Fawkes Night? Some argue that it should be worn with the leaf pointing to eleven o’clock. There are no ‘official’ guidelines on this. The poppy, and Remembrance Day, are used also as propaganda by hate groups like ‘Britain First’ (if you have never heard of them, they describe themselves as ‘a patriotic political party and street defence organisation’ – I think that tells you everything that you need to know), who choose to ignore facts such as that 400,000 Muslim and 1.2 million Indian troops fought alongside the allies in World War 1, many giving their lives, and like to think of it as a symbol of white Britishness. This, of course, is not a reason to object to the poppy, but only to the hate groups, especially as this only helps to further polarise opinions. I do not see, then, any reason why pacifists should object to the red poppy and the Remembrance Day tradition, or why servicemen should object to the white poppy. If they all take the time to understand what each one represents, then they should understand that there is no real conflict in their views, and that both represent remembrance and respect. Your views sound very reasonable to me. The trouble with symbols is sometimes that they can end up taking on a life of their own and representing different things to different groups. Personally, I’m no great lover of war and think WW1 was a tragedy for all concerned. On the other hand, I think it’s perfectly possible to honor the memory of those who took part without that meaning that I’m clamoring for a rematch. Incidentally, Britain First sound like exactly the kind of idiotic thugs you find in every country. The thing that always surprises me about such groups is that for all their bleating on about protecting their purity and uniqueness, the types of individuals involved are all so very similar around the world. I’m glad they’re such a small minority and are nowhere near the levers of power. I’m afraid I have very little time for people like that. Interesting. Here in Canada there seems to be no controversy. Donning of the poppy is something we do to remember those who fought for our freedom. The fallen and the survived. That is exactly how it should be. Unfortunately, here there are many who hijack it and use it as an excuse to push personal agendas.